Movavi’s Slideshow Maker is a genius and affordable tool to create impressive slideshows with your photos and video fragments. Perfect for creating unforgettable evergreens of your memories be it your last holiday trip, pictures of your children, events like birthdays or weddings or any other great moments you enjoyed. With single photos you’re able to create a story full of life with memories you always like to remember. Movavi Slideshow Maker is easy to install and can be used by anyone, it doesn’t require any special knowledge. 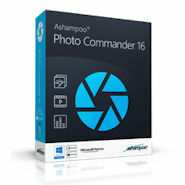 At the same time it offers you tools and creative elements to make really exciting and personal slideshows. You can either use the easy to use wizard or you can use the advanced and full featured mode where you have access to all tools and program features. Even in full featured mode it’s not a difficult to use program but to get used to the program it might be a good idea to start with the wizard for the first steps. For further assistance you will find a lot of help online including a manual, but you will notice that you won’t need much extra help to work with this program. Add media files. Just add the media files, photos and/or video clips, that you want to use in your slideshow project. You can add these individually or even add all files stored in a folder. Your files are then automatically inserted into the timeline. The exact positioning / order of the files on the timeline can be easily adjusted at any time by drag and drop. Equally, you can remove pictures/clips or add more pictures/clips whenever you want from the timeline. Add Transitions. The Movavi Slideshow Maker offers over 90 effects for creating impressive transitions between the individual photos. Several blur effects, artistic curl effects, scroll effects, zoom or wrapping effects, to mention just a few, are available for every idea of how you want present your picture transitions. To add a transition, just drag and drop it onto the timeline at the point between the photos or video clips where you want to see effect. You can add different transitions between different photos. Add Sound. 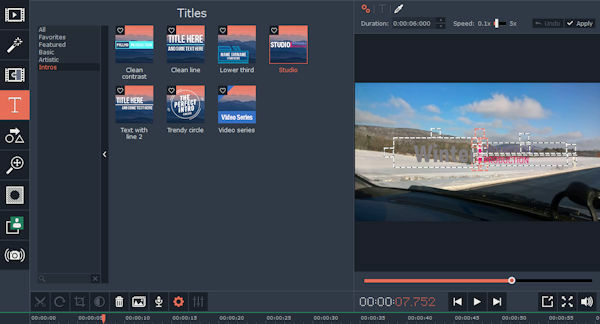 Enhance your slideshow with sound: Movavi Slideshow Maker allows you to add sound to your show by either using the packaged audio tracks or by adding your own audio files. You can also make use of the built-in voice-over recorder to give your slideshow an extra personal expression. This way you can not only use it for private but also for business, for example presentations. The program allows you synchronize the slideshow duration with the speed of your audio track for a harmonic feeling. Now that’s the easy-peasy wizard way. The only thing left to do now is to export your slideshow to the desired output format. 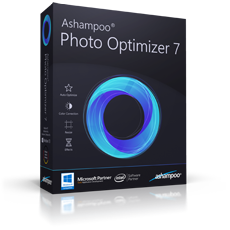 The Slideshow Maker offers you a big range of predefined filters and effects and a lot of extra tools which you can enjoy fully once you switch over to the full featured mode. You can use great filters like flying objects with ghosts, gifts, hearts and more. You can give your slideshow retro feeling or use artistic filters for a very special and unique effect. The Movavi Slideshow Maker developers have put a lot of effort into the program to make your video production easy by handing you unique and spectacular effects. To use them just drag them onto the picture where you would like to see the effect. Each picture can have its own effects. 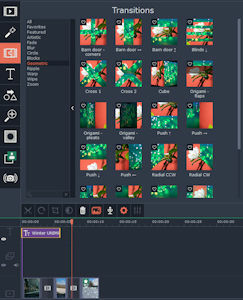 Other features of this wonderful tool include highlighting certain areas of your photos, adding shapes, shapes plus text, circles, connectors, arrows, tick marks, animated effects and a lot more of the so called Call-outs so that you can create nearly endless scenarios of what you want your slideshow to express. If you change your mind, you can always remove everything at anytime. As you have always a preview window in sight you can control everything you do on the fly. A nice feature of the program is that you can save your preferred effects, transitions or Call-outs as favorites which gives you fast access to the tools you like the most. If you think that’s it then think again, there’s even more to discover. Of course you can add text elements to your slideshow. Not only text as it is, but with a lot of extras like flying in, flyby, scrolling text, artistic text, trendy circles and more. A lot of choice to express yourself and to tell a real story with your slideshow. And still you haven’t discovered everything. 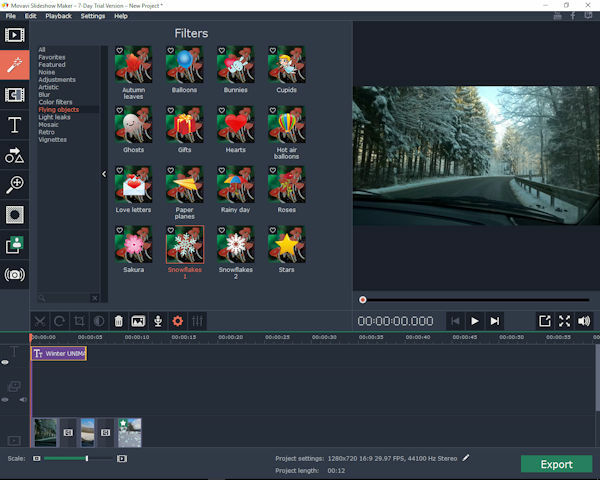 You can use integrated audio tools for effects, normalizing, noise removal, equalizer and there are also a lot of video adjustments settings and tools like chroma key, stabilization, crop and rotate features, color adjustments, adjusting the play speed and a lot more. The more advanced features need a touch more expertise to learn which effects they produce but they offer you a lot of extra fun. Once your slideshow is ready you can export and save it in several video formats like AVI, MP4, MOV und others. Another possibility is to optimize your slideshow for YouTube. 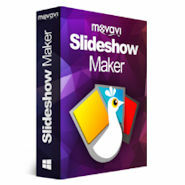 The Movavi Slideshow Maker comes with a lot of ready presets for rendering your slideshow for mobile hardware or TV. Movavi makes use here of its profound knowledge which you can also find in their tool, the Movavi video Converter. The presets make it easy for you to achieve the best possible play back quality on every hardware. It is possible to export a slideshow in several resolutions up to 4K with different sample rates, frame rates, audio channels (stereo/mono), so that the user can influence size and quality. The Movavi Slideshow Maker is easy to learn and use. 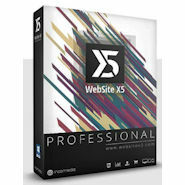 It offers an enormous amount of possibilities to create unique and beautiful rich slideshows with effects, transitions, text elements and style, extra tools and settings. And it makes a lot of fun when you play around with all the possibilities. Try this feature or this setting and your slideshow will give you a completely new expression. 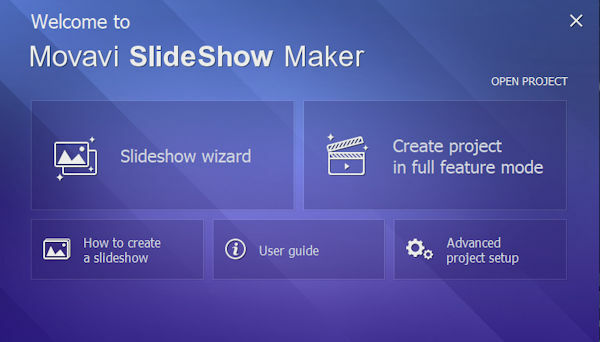 If you thought slideshows are boring then you should give Movavi Slideshow Maker a try and you will find out they aren’t. 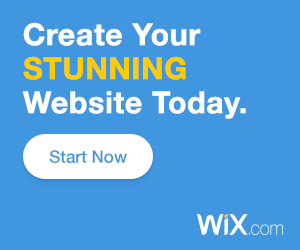 It’s a tool with which you will like to play around and it’s a tool where you really achieve fantastic results and unforgettable slideshows with all your memories and special moments.